This entry was posted on July 26, 2013 at 4:50 pm and is filed under Cancer Stinks, Faith, Family, Getting Older, Personal. You can follow any responses to this entry through the RSS 2.0 feed. You can leave a response, or trackback from your own site. -First of all, I will pray FOR you constantly… When we humans can’t pray for ourselves, then it’s up to those who love us to pray for us. I will do that. -It’s okay to be angry… BUT–it’s not God. We humans live through many good and not so good times. God is always there for us –during both good and bad times… BUT–even God will take your anger –and will still love you and be there for you, even through the anger. -Life is about our ATTITUDE…. I truly believe that if we keep a positive attitude even during the hard times (and the not-so-fair times) –that we will be able to get through those times a much healthier person. -You are a writer…. IF it helps you to write your feelings, then do it… Write a book–even if nobody reads it but you. ANYTHING which helps you is something you should do. Well—I’ll stop my thoughts but if you ever need to talk, just let me know. I haven’t been where you are –but I’m a good listener…. Beth, I have been an absent friend by far, but I am still your friend in my heart and thoughts of you fill my heart right now. I think every single thought or feeling you have is something you are entitled to think or feel at this time. This is one of the “benefits” of cancer: you get to have thoughts and feelings and it’s okay! Holding you close, dear person. I think of you and your blog often, Beth. Sending prayers and the very best thoughts to you and your family. Peace be to you during this challenging time and God will direct you ,as well as, your lovely family. I will also pray for you. Being angry at God is okay — God is big enough to take it and still love you. It’s human to be discouraged and upset about news like this. Of course I’ll pray for you. I’m holding your hands in my mind right now, and I’ve got a shoulder to cry on, if you need it. I’ll email you my new phone number, in case you need to talk to someone besides family. I wish I lived close enough to give you a big ole bear hug right now. I feel like we’re face-to-face friends and, even though we’ve never met in person, I love you and your family. Be strong and hold on tight to my hand, okay? Praying for you. While I don’t totally believe in the Christian “God” I do believe in the power of prayer. May you find the blessings that this challenge in bringing you. I pray for complete and quick recovery of good health. Blessings be. I’m so sorry that you are going through this, Beth. I think about you all the time, and pray that you and your family are all doing well. I will pray that everything turns out well for you. It must. Somewhere in my future, or on my bucket list, really, there is a cross country tour of the US. And on that tour, there is a stop in your lovely area to visit with you, hug you and laugh with you. So I will pray very hard for you, for good health, for this vision to happen, for us to meet. Being angry at God is okay. He understands. He loves us no matter what. May you find all the strength you need! I am thankful for all the caregivers who will assist you. Bless you! Greedy supplicant…haha…”supplicant” is a term in Linux used to describe a process which establishes a connection with a resource (WPA supplicant being the wireless service). So that made me laugh! You are sweet, sweet, sweet to the core. Embrace your anger, embrace your hard-won joy, and know that you have a friend in me. Always and forever. And I forgot to mention; lovely sparrow picture. It’s life size!!! Ohhhhhhh …… Beth!!! I’m so so sorry to read this! I will pray for you every day, in my own way, for your speedy recovery. Your anger is totally understandable but, as others have commented, God is big enough to understand and forgive. Keeping a journal sounds like a good idea to me. Try to stay positive, friend – there is power in that. Sending you a big hug! I’m so glad you wrote this, Beth. You are in my thoughts and I am hoping each day will be a new and brighter beginning for you. Beth, please try not to worry. Breast cancer is one of the most curable cancers. Please stop worrying about what we think when you speak and you write. Let us be your friend and let us love you like you have been our friend and have loved us. Your post reminded me of Tevye from Fiddler On The Roof…always praying to God, even when he was angry. I love those lines, they always make me laugh! I am so sorry about you having cancer, and you can bet that I will be praying for you. Like most women, I think that you are much stronger than you know! I totally understand you seeing the mockingbird and that it made you feel thankful. 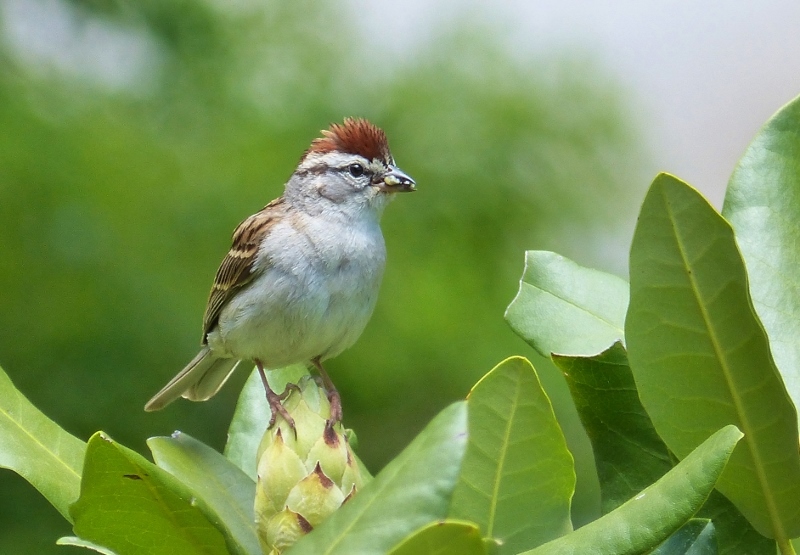 I love the photo of your chipping sparrow too. It stinks that you have cancer. I wish you the best outcome, and I send my love. I guess God is giving you a Job. I just came to see your blog and read the last post. How my heart aches for you, and I will be praying for the Lord’s help and blessing. May He heal you and grant you great grace and strength.